Someone wants to hire October Kohl. First mistake. Trypso is a below average world filled with below average people. October Kohl wants off the crust and away from the wannabe Yakuza there. When the crime syndicate contacts Kohl with an opportunity to be free of both them and Trypso, Kohl jumps at the opportunity. The job’s easy money: deliver a package to another planet. Get paid. Then grab a beer. When a rival gang gets his scent, Kohl must make an unlikely alliance with the captain of an ex-war heavy lifter. If they can’t get along, everyone’s dead for sure. If they manage not to kill each other, the prize is riches and freedom. What could go wrong? 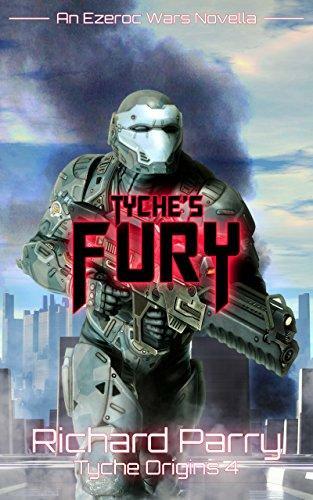 Tyche’s Fury is the fourth novella in Richard Parry’s gripping Tyche Origins pentalogy. If you like page-turning space opera with great dialogue and heart-pumping action, get your copy today!